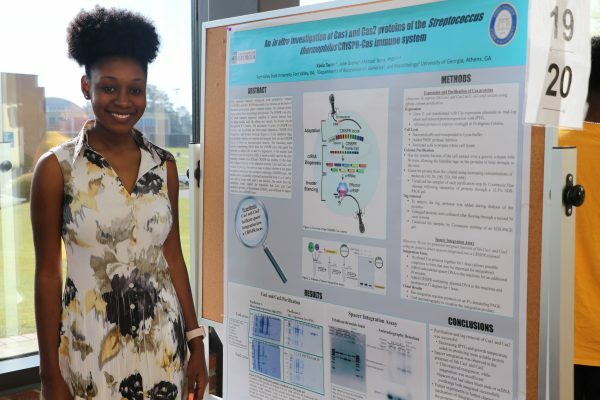 Since 2010, Fort Valley State University’s annual Research Day has provided an on-campus forum for students to showcase their research pursuits. For many students, the day offers the opportunity to share their undergraduate and graduate research with their colleagues from other disciplines while engaging in discussion and soliciting feedback. FVSU Research Day is held in the spring of each year for the students enrolled at the Fort Valley State University. This special event offers each of us an opportunity to recognize and celebrate the achievements of exceptional undergraduate and graduate students engaged in stellar research and creative endeavors in the areas of STEM, social, human and behavioral sciences, and the humanities. We encourage all academic departments and programs at Fort Valley State University to reserve April 18, 2019, for this special event, and to support participation by your undergraduates, graduate students, and faculty and staff. Questions? Contact Dr. Andrew Lee, director, FVSU Undergraduate Research Program, leea@fvsu.edu or (478) 825-6708. FVSU Research Day is a collaborative initiative between the Undergraduate Research Program and the Office of Academic Affairs. The Fort Valley State University family is pleased to announce that the Ninth Annual Research Day will be held Thursday, April 18, 2019, from 8 a.m. to 4:30 p.m., in the C.W. Pettigrew Center. We are calling for poster, oral, and artistic submissions from undergraduate and graduate students from across all disciplines. We encourage faculty to mentor your students through the process so that they can be prepared to participate in this rewarding event. Examples of abstracts and presentations are free to modify and use in preparing presentations. Oral Presentation Rubric (docx) (Oral presentations should be no more than seven minutes). The deadline for all submissions is no later than 5 p.m. on Friday, March 8, 2019. For questions or assistance, please contact Dr. Andrew Lee, director, FVSU Undergraduate Research Program, leea@fvsu.edu or (478) 825-6708.